We arrived in Lima, Peru early Saturday morning (like 3 am). Lima is a very interesting city where the Spanish roots date back to the 1600 Conquistadors. It is very crowded with a population of 10,000,000 in the city. Most of the population is very poor and the swimmers are seeing what 3rd World country is like first hand. The Island boys settled in with their training group, the three boys from London and Oakville Ontario are Mack, Braydon and Matt. Coach Aaron has been training this group from day 1 and they all fit in well together. Yesterday was the much anticipated start of the meet and the Canadians started off with a roar!! Canada put 8 swimmers through to finals or semis and 2 relay teams to finals. In the evening, the first event saw Chad Bobrosky and Keegan in the 400 free final. The race was close from start to finish with Chad just getting out touched by a Japanese swimmer for the gold medal. The women's 4 X 200 free then stepped up to grab Canada another Silver Medal. The most exciting race was the 4 X 100 Free for men, Canada qualified 1st in the morning, just ahead of USA. The team had Luke Peddie, Alec Page, Omar Arafa and Chad Bobrosky for the evening final. By the time the second swimmers hit the water it was a tight race and the stands were rocking. 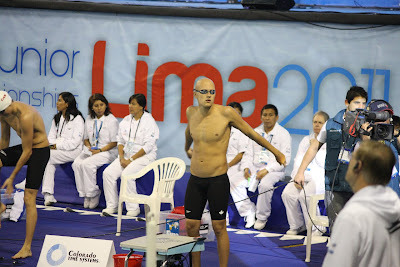 By the 3rd swimmers, it was obvious that this was going to be between Canada and USA. On the last leg of the race, USA took off slightly ahead of Canada. Chad had pulled Canada within a few hundredths of a second with 50 to go but just couldn't manage to make the small gain needed to overtake the USA team and it came down to settling for silver on the touch. With that silver we have out medalled the Canadian performances from the two previous World Jr. Championships combined. Tonight Canada has 4 swimmers in finals so we will be looking for Gold and more podiums.